Posted by Jill S. Schneiderman in contemplative practice, poetry. Sylvia Boorstein, meditation teacher, psychotherapist, and storyteller, read this poem in a recent dharma talk. I like it because it speaks to the creativity that can arise unexpectedly from what might otherwise be experienced as annoyances. Posted by Jill S. Schneiderman in contemplative practice. My ears perked up when I listened to this story on Weekend Edition this morning. 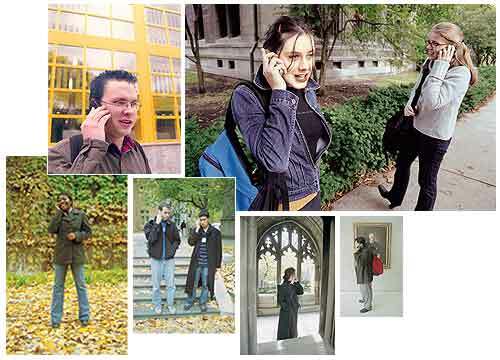 Studies at Ohio State University reveal the sometimes fatal danger posed to pedestrians who walk while talking on a cell phone or listening to an MP3 player. A less catastrophic though still unfortunate consequence follows from this behavior. People do not greet or even acknowledge one another along campus walkways. In this way, members of a fragmented community become less connected to one another. What’s more, the multitasking involved causes the mind to be distracted, as evidenced by the study highlighted in the NPR story. Walking across campus after class students rush to turn on the electronic media or make a call instead of conversing with a classmate or strolling silently allowing class material to sink into the mind. Campuses need to cultivate contemplative spaces. Should we ban cell phones and electronic media from public walkways?